Jehovah's Witnesses have often found themselves on the receiving end of sharp criticism where ever they go as they seek to spread their gospel. Why is this? A variety of reasons may be cited, ranging from blatantly religious bigotry to ignorant mockery, attacks we certainly in no way support but would roundly condemn. Roughing anyone up verbally or physically is certainly the work of carnally insensitive and ignorant individuals that no one should have to endure. However, one of the charges that is often leveled at Witnesses by those they call upon is that their organization, far from being a Christian ministry, is instead a destructive cult group that has adversely affected the members of the community. This unpleasant accusation follows Jehovah's Witnesses where ever they go, and has increasingly been a serious impediment to their work. The February 15, 1994 issue of The Watchtower magazine represents one of the more recent efforts by the Watchtower Society to counter the numerous charges made against it that it is not a Christian fellowship but a destructive cult. 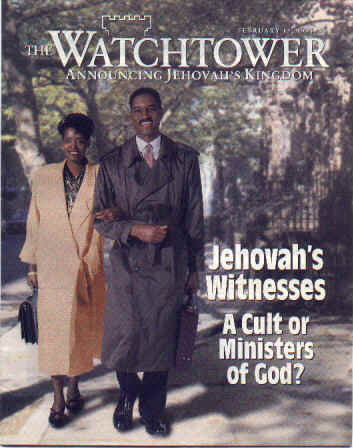 The title of the issue, which reads "Jehovah's Witnesses: A Cult or Ministers of God," is the first sign the casual reader may have that the Society has been experiencing a serious amount of mounting trouble trying to convince both it's Witness constituency and outsiders that it is not a cult that destroys lives. We wish to examine the question the Society has posed on page 4: "Are Jehovah's Witnesses a cult ?" Let us briefly outline the content of The Watchtower magazine as it addresses this issue. The first article is entitled "Cults - What Are They?" and the second "Are Jehovah's Witnesses A Cult?" In the first article, we are taken to Waco to review the Branch Davidian tragedy and supposedly see what a real cult actually is like while the Watchtower quotes several sources to develop a composite definition of what a cult is, admitting frankly that what it calls "anticult organizations" will refer to Jehovah's Witnesses as such a group. The best definition of a cult that the Society admits to is found on page 4, it's source being the language of a state resolution: "A cult is a group or movement exhibiting excessive devotion to a person or idea and employing unethically manipulative techniques of persuasion and control to advance the goals of its leaders." The second article "Are Jehovah's Witnesses A Cult?" draws heavily upon this composite definition to bolster the Watchtower's argument that it couldn't possibly be a cult, even citing Scripture to prove how the opposition made against Christ and the apostle Paul are examples of how new religious figures and groups with radical views and practices could be viewed as cultic. On page 6, the anonymous Watchtower authors exclaim "many who are not Witnesses readily acknowledge that there is nothing freakish or bizarre about Jehovah's Witnesses. Their conduct does not clash with what is accepted as normal social behavior." Responding to the same unnamed critics who cite them for the usage of coercive mind control techniques, on the same page, the Watchtower asks Witnesses if mind-control techniques were ever employed on them. "'No' would doubtless be your frank response," the article assures us. Pages 6 and 7 declare that "..Witnesses recognize that it is their Scriptural responsibility to love and care for their families. They live and work with people of all races and religions. .. Jehovah's Witnesses are 'absorbed in humanity.'" Finally, on page 7, the Watchtower attempts to deftly evade the charge of cultism when they state that "the veneration and idolization of human leaders so characteristic of cults today is not to be found among Jehovah's Witnesses." In other articles on our site, we have used both theological and psychological perspectives to define what constitutes harmful and abusive activities in high-demand social groups, which - like it or not - are called "cults." We have stated that from a Christian perspective, a cult is any group of people who follow one man or the group's definition of spiritual practices and teachings that always contradict orthodox Christian doctrine and advance heretical or aberrant doctrine. We have also stated that, from a psychological perspective, the group will intentionally exert some form of deceptive recruitment and manipulative indoctrination to exert a very real and effective mind control on members of the group. These distinctives of destructive and damaging cultism are prevalent among many groups around the world, and the Watchtower certainly cannot escape this assessment. We will avoid discussion of theological perspectives here (saving this for another article). The Daily News quotes Dr. Carl Raschke, a professor at the University of Denver, as commenting: "I see a lot more violent cults forming, and violent abuse occurring in the guise of occult beliefs." Experts at the seminar also warned that such hate groups as the neo-Nazis and the Ku Klux Klan are using occult trappings to attract members and gain more control over them. In various countries disturbing reports have surfaced about religious cults that abuse children with sadistic sexual practices and torture. A cult is a religion that is said to be unorthodox or that emphasizes devotion according to prescribed ritual. Many cults follow a living human leader, and often their adherents live in groups apart from the rest of society. We have already mentioned the fact that persecution against true Christians became harsher after 1935. Why? On April 9, 1935, the Cults Department of the Ministry of Home Affairs issued a circular on "Pentecostal Associations." At that time the authorities had not properly identified Jehovah's Witnesses and thought they were part of the "Pentecostal" community. The circular was sent to the provincial administration centers, calling for the immediate disbanding of those associations whose activity was declared to be "contrary to our social order and harmful to the physical and mental welfare of our race." During the time of the Fascist Italian government's persecution of Pentecostal Christians in 1935, the Society's Italian membership exerted great effort to distance itself from them on the basis that the Pentecostal groups were, as charged by Mussolini's governmental officials, undermining Italian society with subversive social activity that was both disruptive and harmful. This Watchtower apologetic - of distancing itself from other local groups whose activity appears to be far more outrageous then local Witness congregations - is important to bear in mind since it shows how the Society defends itself from a charge it has had to face in many countries where other religious groups and authoritarian rulers have not tolerated its presence. It, in effect, went on to scorn the Pentecostal movement in the Italy of the 1930's as the real villain. This "whipping-boy" tactic would be used again and again the Watchtower throughout the 20th century. It explains how this assumption became a standard defensive tactic in the Society's repertoire of resistance offered against critics. The Watchtower essentially conditioned itself to accept this stereotype through much of the mid to late 20th century, and from the 1960's onward, the sharp rise of horrific cult activities has tragically served this crafty contention. Since Witnesses do not engage in antisocial activity resulting in wholesale death, destruction and disruption of human life, the Watchtower argument goes, it cannot be considered a cultic group. Cult groups freely use deception and manipulative ploys to attract members. Witnesses will point out many societal ills and the failure of religious belief to cure them to argue their case at doorsteps and street corners around the world. But they are led by Watchtower indoctrination to present many more arguments based upon falsehood (contrived research used to manipulate facts to their advantage) or distortion (overstated or implied conclusions aimed at making things seem worse - or better - than they are). "Bible studies" offered free of charge by Witness Pioneers do not study the Bible, but selected Watchtower literature using their specious argumentation to indoctrinate. Recruits are warmly greeted by the local congregation and an almost instant intimacy is established with them in an effort to present themselves as truly loving Christian people. This warmth quickly fades to a relationship of conditional love based upon the convert's ability to successfully conform to their standards -but not before they are made baptized members. Cult groups routinely exalt their dogma at the expense of the welfare of members. Witness lifestyle is controlled by Society teaching supposedly based upon Biblical interpretation, which in many cases, turned out to be entirely arbitrary. Bans on organ transplants and vaccinations were later removed, but not before untold thousands of Witnesses suffered crippling or fatal results of their obedience to these "Biblical" teachings. Many in an entire generation of Witnesses during the 1930s and 1940s put off marriages and family so their "preaching" work of an impending Armageddon would not be slowed. Blood transfusions today are still rejected as "unbiblical" - and some Witnesses still die. Witness children are instructed to avoid any interaction with non-Witness children in school and playtime activities to keep them "pure." And even marital sexual practices have been rigidly controlled by Society teaching, down to even precise positioning. Through it all, the "truth" and authority of the Watchtower was continually vindicated, even if it cost the well-being and even the lives of Witnesses who looked to it for leadership in godly living. Cults utilize some form of leadership structure that is illegitimately exalted A major Society publication known as the Proclaimers book tried bravely to downplay just how many early Bible Students (the precursors of today's Jehovah's Witnesses) passionately believed that Charles Taze Russell, the first Society president, was the "faithful slave" of Matthew 24, and therefore was a unique voice for God in the world (1). Although no one man today is exalted by Witnesses, the reverence and blind loyalty given to the Watchtower Society by Jehovah's Witnesses worldwide can not be described as anything but a veneration of human leaders. Witnesses unceasingly praise the Society, led by its' Brooklyn, N.Y. -based Governing Body, as the only true channel of Jehovah God in a dark and evil Babylonian world, the only sure leadership said to be filled with "holy spirit", and therefore, virtually infallible. On page 7, the article cites approvingly a reference work which notes the Witness rejection "of a clergy-laity distinction," and yet firmly upholds the sharp distinctions between the "anointed" leadership and the "great crowd" of Witness membership. This attitude is nothing less than a last-day rise of idolatry, the establishment of a leadership caste "more equal" than others. This is only the tip of a cultic lifestyle iceberg shaped by the Watchtower Society that barely breaks the surface of the sea of humanity it smashes through. Remember that most of an iceberg's vast and irresistible mass is unseen to those observing them from surface ships. We hold that this behavior, when placed into the context of a seemingly balanced and Bible-based lifestyle, is so well concealed that only careful observation can reveal it. When incidences of this cultic behavior among Jehovah's Witnesses are distributed evenly throughout the course of time, instead of being overtly, immediately manifest in the case of less-discrete cultic movement lifestyles (such as the Hare Krishna and Nation of Islam groups), their ability to conceal the reality of their profoundly cultic lifestyle is that much more successful. Most Witnesses recognize this antisocial behavior for what it is at one level of consciousness or another, but ultimately conclude that it is a "Bible-based" course of action. Couple this sincere faith in the Society to their personal desire to please God and their outrage at seeing their piety and labor questioned by outsiders who haven't been "taught the Bible" is understandable; it is no wonder Jehovah's Witnesses will arise in anger to bitterly protest. Yet those are the facts. emotional control - The human capacity to both suffer guilt and quail in fear is exploited to an unspeakably insidious way by the Society to reinforce the black and white mentality of the Watchtower's worldview. Fears of a demon-haunted world, of the fate of non-Witness loved ones, of an impending Armageddon, of not being "remembered" by Jehovah in the resurrection, and above all, of being expelled from the Society are always in the back of Witness minds and hearts. Guilt over not working "hard enough" for Jehovah, for having sinful thoughts (such as questioning the local leadership), for neglecting study meetings, and for being unable to meet the code of conduct of a "clean organization" are also woeful companions for many, many Witnesses. This terrible internal pressure is subtly yet unmistakably paranoiac and has caused untold trauma to many Witnesses unable to withstand the mental stress. And to resolve this, the Witness constituency is endlessly admonished to bury themselves in faithful service to the organization, and to trust that Jehovah will take care of it all. Relief is then contingent upon service, and those who struggle emotionally are often viewed as lacking somewhere in that area. Of the millions of non-Witnesses who are studying the Bible with the Witnesses or who have studied with them at one time or another, we ask, Were there any attempts to brainwash you? Did the Witnesses employ mind-control techniques on you? "No" would doubtless be your frank response. Obviously, if these methods had been used, there would be an overwhelming number of victims in contradiction to any argument in favor of Jehovah's Witnesses. The rhetoric here bravely attempts to squarely face the evidence we have discussed but only raises more questions than it tries to answer. If the millions of individuals the Society has indeed targeted in the past for recruitment were to be fairly queried about possible mind control usage upon them, why didn't the Society explain what it is? Why was the ominous term like "brainwash" raised and then left completely undefined so those same millions could legitimately consider the issue? Cult mind control is designed to deceive an individual into voluntarily relinquishing the control over the only tool they have to make an objective judgment, that being a free mind. So therefore, how could those Witnesses whose reason and perception that has been controlled by the Watchtower organization be expected to give an objective answer to their rhetorical question on "victims"? Such questioning is like asking a hostage by telephone, with a gun to the back of his head, to condemn his captors. It is not likely to happen. Why do those who have attempted to raise the question who were former Jehovah's Witnesses treated like reprobate dissidents who are labeled "apostates" - and hence off limits to all active Witnesses? Why does the Watchtower so firmly declare dialogue with former members as an off-limits activity that can be punishable with disfellowshipping? The Society's attempt at candor here fails miserably. The hard truth is that the real victims of abusive Watchtower control are instead dismissed as bitter losers who could not measure up to "God's requirements" and who are branded as enemies of the Watchtower state. Responding To The Watchtower's Arguments: Where's The Love, Man? The Society routinely engages in great self-promotion when Witnesses, on doorsteps, street corners and in wildernesses around the world, point to their warm, communal love for all within their organization. In the article, the Society reiterates this point on pages 6 and 7 by citing a Czech reporter's alleged byline that stated "..they are not fanatics. They are are people who are absorbed in humanity." The Watchtower goes on to explain that "Witnesses recognize that it is their Scriptural responsibility to love and care for their families. They live and work with people of all races and religions. .. Clearly, Jehovah's Witnesses are 'absorbed in humanity.'" We have heard, time and again, this same pious claim coming from many Witnesses that their group alone embodies the spirit of Christ's command to "have love among yourselves." (John 13:35 NWT). We must be on guard against extended association with worldly people. Perhaps it is a neighbor, a school friend, a workmate, or a business associate. We may reason, 'He respects the Witnesses, he leads a clean life, and we do talk about the truth occasionally.' Yet, the experience of others proves that in time we may even find ourselves preferring such worldly company to that of a spiritual brother or sister. (p. 24). The perpetual suspicion that a "worldly" person automatically will lead the "spiritual" to stray from Witness principles hardly demonstrates an absorption with humanity. Indeed, it only serves to show how socially isolated Witnesses are expected to be from the larger society outside their organization. This separatist attitude contributes to an aloof posture by most Witness communities to their local community. There is little to no corporate participation by Jehovah's Witnesses in mutual efforts put forth by other community groups for the local common good, such as the support of food banks, pro-life activism, or mentoring programs for youth at risk. "Clearly," the article says on page 7, "Jehovah's Witnesses are 'absorbed in humanity'" - but in practical reality, the global Watchtower constituency has yet to come anywhere close to even remotely suggesting that such an "absorption" is part of a "compassion consciousness" Witnesses excel in. We must sadly conclude that millions of sincere Jehovah's Witnesses worldwide are indeed being led astray by a powerful and destructive influence originating from the Watchtower Society that cannot be called anything else but cultic. We take no pleasure in making this assertion, yet we do so out of loving concern for Witnesses everywhere, and for those involved with them. It is our prayer that this article has helped you see why so many do indeed feel the Watchtower is cultic to the core, and why all truly God-fearing people should recognize it for the human enterprise it has long, long ago become. If you are laboring under the spell of marching to the Watchtower's organizational drumbeat, we would encourage you to turn away from any blind obedience to a man-made religious organization and instead, consider once again the warm love and call of Jesus Christ for real and eternal salvation. His saving grace, which bestows true peace and communion with God is given so freely and immediately by nothing more and nothing less then faith in Him and Him alone for the forgiveness of sin. No organization can ever equal that! Turn to Christ Jesus for true salvation and the Scriptures for true instruction on Godly living, not the dictates of a cult group like the Watchtower Bible and Tract Society of Brooklyn, New York. (1) Jehovah's Witnesses: Proclaimers Of God's Kingdom, p. 143: "The view that she (Russell's wife) voiced concerning the identity of the 'faithful servant' came to be generally held by the Bible Students for some 30 years. Brother Russell did not reject their view, but he personally avoided making such an application of the text .."
(2) Combatting Cult Mind Control, page 59. (3) Independent thinking is the unforgivable sin among cultic organizations, since it engenders free thought and reflection and enables members to examine their attachments to them with an objective eye. Hence, the Watchtower sternly admonishes Jehovah's Witnesses to not engage in it, equating it with spiritual darkness: "From the very outset of his rebellion Satan called into question God's way of doing things. He promoted independent thinking. 'You can decide for yourself what is good and bad,' Satan told Eve. .. To this day, it has been Satan's subtle design to infect God's people with this type of thinking.-2 Timothy 3:1, 13. How is such independent thinking manifested? A common way is by questioning the counsel that is provided by God's visible organization." (The Watchtower, 15 January 83, p. 22) "But a spirit of independent thinking does not prevail in God's organization, and we have sound reasons for confidence in the men taking the lead among us. (The Watchtower, 15 September 1989, p. 23). "Due to background and upbringing, some may be more given to independent thinking and self-will than others. Perhaps this is an area where we need to discipline ourselves and 'make our mind over' so that we can perceive more clearly what the 'will of God' is.-Romans 12:2." (The Watchtower, 1 February, p. 19)." (4) Understanding Mind Control Among Jehovah's Witnesses, p. 30. (5) In fact, a scornful rebuke used by Witnesses is to call those assisted by local church benovolence ministries (like food banks and clothing depots) by the insulting term "rice Christians," indicting them as converts who were lured by promises of food handouts. They go on to self-righteously decry the use of food as a "bribe" to make converts (an ugly accusation usually without any merit whatsoever). Their desire to avoid being guilty of such an allegation is their most cited reason for steering clear of any kind of ongoing community assistance ministry. And while Jehovah's Witnesses take great pride in being recognized for their one-day building projects that erect new Kingdom Halls, and are quick to point out how the unified effort of hundreds of Witnesses made it possible, you will never find them at the worksites of places like a Habitat for Humanity house-raising, a community clean-up day, or an evangelical "March For Jesus." And in virtually each instance a Witness response to natural disaster is reported upon in Society publications, invariably the aid is directed towards Witnesses only. The article "Christian Love Amid Disasters In Mexico" (Awake!, April 22, 1996, p. 31) is a perfect example of this. Paragraph after paragraph detailing the destruction wrought upon Witness homes and Kingdom Halls also showed how the aid Witnesses gathered went exclusively into their helping their own, while over half a million non-Witness Mexicans suffered privation. "Frequently, people noted regarding the Witnesses and their relief work: 'These really are brothers.' 'They are the better organized group.'"